Ewood Park, 1904. Blackburn Rovers v Aston Villa. 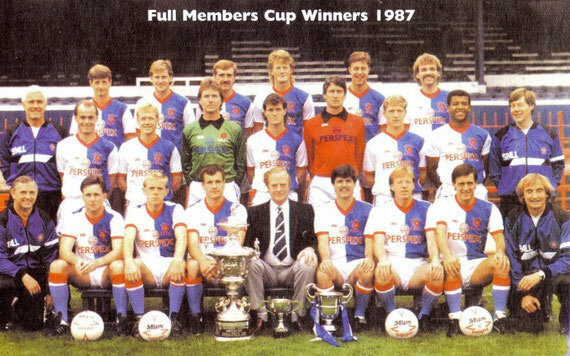 Ewood Park, 1985. Blackburn Rovers v Oxford United. During an FA Cup game involving Chorley (classed as the home team) and Preston North End on 06.12.1986 there were ugly scenes of crowd trouble when the Blackburn End erupted in violence. Police arrested eight Blackburn people from Blackburn along with twenty four others. Organised elements of Blackburn Rovers, Chorley and Preston North End were involved in “three cornered clashes”; arrests came before, during and after the game. Most of the trouble came in Blackburn Town Centre, along Bolton Road as well as inside Ewood Park (Blackburn End) and outside the Ewood Park. No extravagant, up-his-own-arse goal celebrations: Wallop, back of the net, arms in the air (or usually just the one) and a big smile for the fans. Arguably the greatest Rovers player, ever. Blackburn: The Blackburn Diocese -"The Church of England in Lancashire"
"Blackburn has no 'lads' " - "This ones dedicated to the next generation of Blackburn Youth"